Ever since I saw the first yellow, sun-like flower of the season, I was sure I am going to cook with it. This plant, a bothersome weed for those who want a luscious and perfect like a golf course lawn, is a tasty edible flower, a nutrient-dense green believed to be some of the oldest plants on the planet. 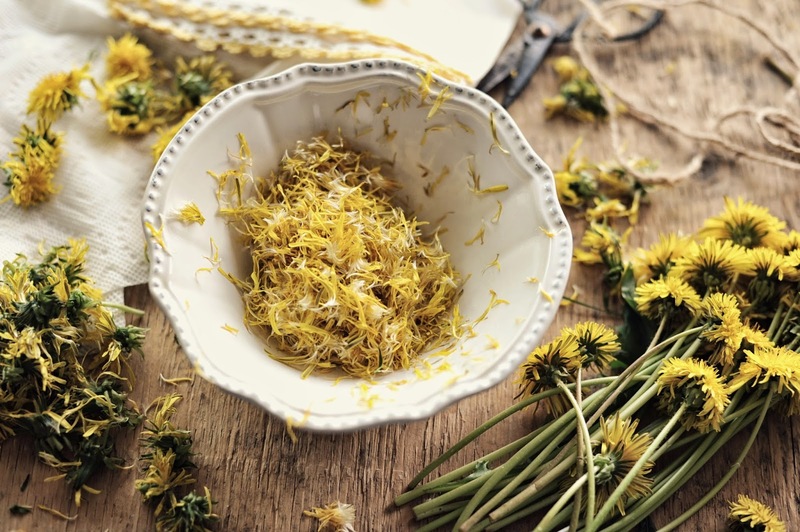 Throughout history, the dandelion has been known as super food, herbal medicine and delicious, sunshine-filled drink. Remember Ray Bradbury's novel "Dandelion Wine"? With his lyrical writing style, the author portrays the dandelion as a glorious flower, harvested every year by the boy's grandfather for dandelion wine that would keep all of the summer joys into a single bottle for when the winter season comes. "The boys bent, smiling. They picked the golden flowers. The flowers that flooded the world, dripped off lawns onto brick streets, tapped softly at crystal cellar windows and and agitated themselves so that on all sides lay dazzle and glitter of molten sun. "Every year", said Grandfather. "They run amuck; I let them. Pride of lion in the yard. Stare, and they burn a hole in your retina. A common flower, a weed that no one sees, yes. But for us, noble thing, the dandelion. So, plucked carefully in sacks, the dandelions were carried below. the cellar dark glowed with their arrival, the wide press stood open, cold. A rush of flowers warmed it. The press, replaced, its screw rotated, twirled by Grandfather, squeezed gently on the crop. The golden tide; the essence of this fine, fair ran, the gushed from the spout below to cropped, skimmed to ferment, and bottled in clean ketchup shakers, then ranked in sparkling rows in cellar gloom. The words were summer on the tongue. The wine was summer, sought and stopped..."
Every part of the dandelion is edible both raw and cooked, from the roots to the blossoms. The leaves can be use in salads, also steamed or added to a stir-fry or soup. The roots can be dried and roasted and are commonly used as a coffee substitute or a cleansing and detoxifying tea. 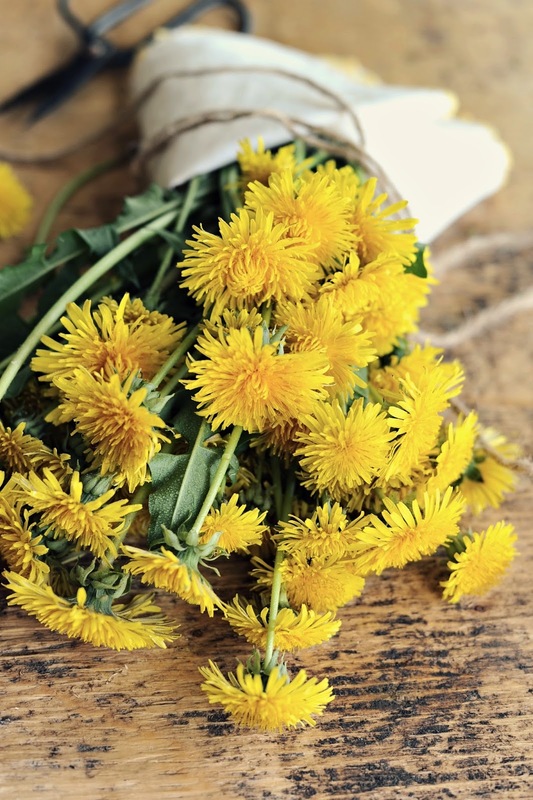 The yellow flowers are sweet with honey-like taste and can be eaten raw, put in bread and cakes and, of course, used to make dandelion wine. Herbalists and nutrition experts report the dandelion is highly nutritious and can treat a variety of ailments. A rich source of vitamin A, C, fibre, potassium, iron, calcium, zinc, trace minerals, antioxidants, and protein, the plant helps to treat anemia, heart problems, acne, liver and kidney disease and mainly digestive complaints. The recipe is based on one from the inspiring book by Miche Bacher "Cooking with Flowers", which I presented here. Preheat oven to 375 F. Line standard muffin tin with paper liner or coat pan with non-stick spray. Mix together the dry ingredients- flour, baking powder, salt, dandelion petals, apricots, and almonds. In a separate bowl, whisk milk, honey and oil. Beat in the egg. Add liquid ingredients to dry and mix by hand to combine (hands prevents overmixing). Pour the wet batter into the prepared pan. 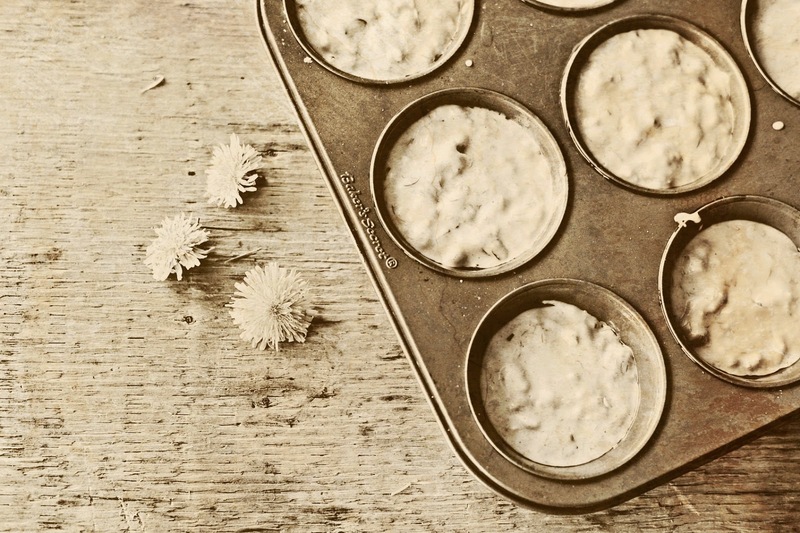 Bake for about 30 min, or until a toothpick inserted in the center of muffin comes out clean. * The dandelion is generally considered safe in food; however some people may have allergic reactions to it. 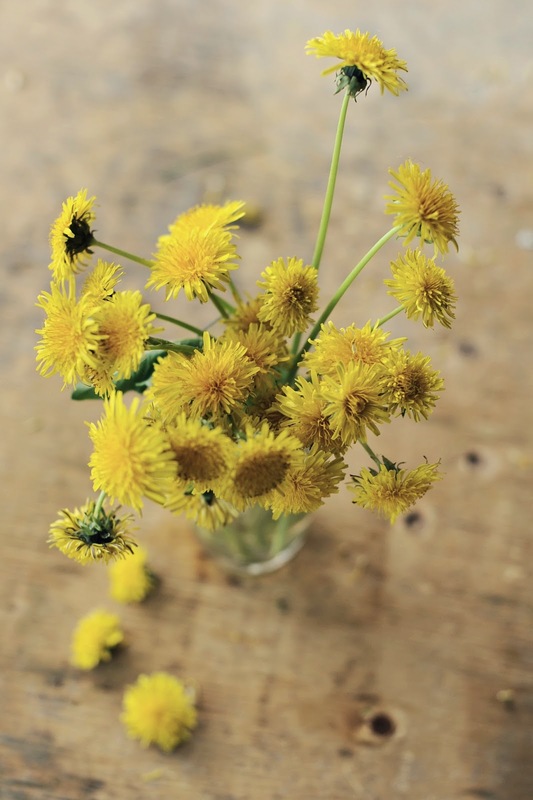 Gather dandelion flowers from areas free of chemical treatments or fertilizer. Pick in a sunny part of the day, so the flowers are fully open and prepare right away. Once picked, they do not last long. Happy June to all of you! I may have to get brave and give it a try ... my neighbor up the street has tons of them in his yard...I'm sure he won't mind my picking some! This is a recipe I must try out! Happy June to you, too. 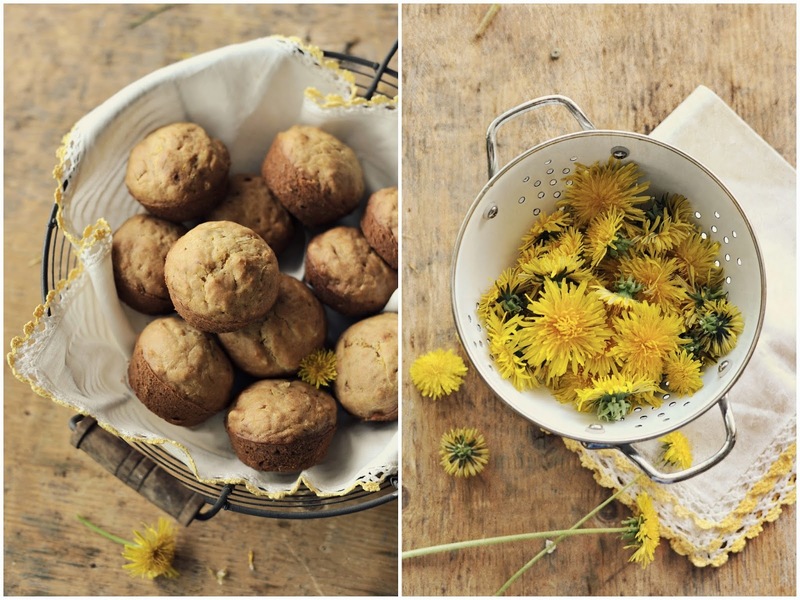 I don't know if I'd ever eat any part of the dandelion but the muffins sound quite delicious. Happy June to you! These muffins are absolutely fascinating Sylvia! I want to try one...I've hear dandelions are so good for you, so what a great idea to put them into baking! Good morning Sylvia! It is a memorable summer already, seeing friends like you post again with such intriguing ideas. Happy SUMMER! And....I have never tasted dandelion greens, let alone the flower! I would be leary of picking any around here, for here where I live, dandelions are a menace. My husband as well can't stand them, so many chemicals are used throughout to destroy them. I would however, leave them be. I love the yellow appearance because it means spring is here and winter has dashed off. Your muffins sound GLORIOUS, and the mix with the apricots I'm sure adds a sweetness of summer. Another BEAUTIFUL post my dear. Your photos are always so lovely and so my visits here are full of sighs from me. Kuddos to you for finding such good use for dandelions. We are infested here. I might follow your advice. And the pictures are absolutely gorgeous. My mother always made dandelion jelly. Which I LOVED! People are so funny about dandelions . . . they seem so upset about them. I've always loved seeing yellow flowers! What a gift. 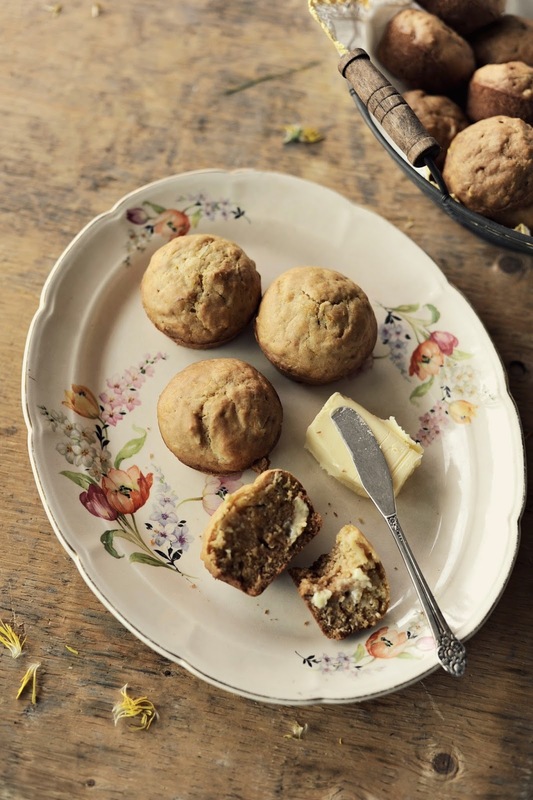 I might even try your muffins :))) Thanks for another beautiful post! I'm intrigued by these. I've had dandelion tea, but never eaten them. Lovely photos! love seeing the dandelions in your colander! I made dandelion jam once - delicious!